Correct replacement of the 4-5/8" trunk lock cylinder shaft to latch rod. 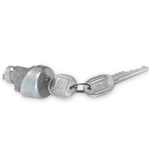 This rod extends from the outer trunk lock cylinder to the inner latch assembly and allows the lock to engage when the key is turned. Correct replacement of the trunk lock cylinder shaft to latch rod. This rod extends from the outer trunk lock cylinder to the inner latch assembly and allows the lock to engage when the key is turned. Reproduction of the original 1970-78 Camaro RH door lock pawl that mounts at the end of the door lock cylinder which allows the door latch assembly to be activated when the key is turned. Reproduction of the original 1970-78 Camaro LH door lock pawl that mounts at the end of the door lock cylinder which allows the door latch assembly to be activated when the key is turned. Reproduction of the original 1979-81 Camaro RH door lock pawl that mounts at the end of the door lock cylinder which allows the door latch assembly to be activated when the key is turned. Reproduction of the original 1979-81 Camaro LH door lock pawl that mounts at the end of the door lock cylinder which allows the door latch assembly to be activated when the key is turned. Gasket used to seal trunk lock cylinder bezel to body on 1970-73 Camaro models. Molded style gasket. 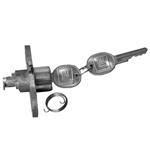 Reproduction ignition key switch with two square head GM keys. Exact fit reproduction of the 1970-81 Camaro and 1972-81 Firebird glove box lock with OE style keys. Comes with (2) keys. Reproduction door locks with two round head GM keys. 1974-77 Camaro Round Head Trunk Lock with keys. Highest quality guaranteed to meet or exceed OEM. 1978-81 Camaro Round Head Trunk Lock with keys. Highest quality guaranteed to meet or exceed OEM. Reproduction of the original chrome trunk lock bezel for use with 1970-1973 Camaros. This highly polished chrome bezel will replace your old rusted bezel exactly. Also available, the trunk lock bezel molded gasket.